Hosted Desktops (DaaS) are quite flexible and there are many offers out there depending on your budget and needs. A lot of these services are also customizable; a top requirement for service providers swimming in an industry with near-infinite combinations of needs and wants. Let us look at the three most common types of desktop virtualization. Shared Remote Hosted Desktops – This can be summed up in one word, “terminal”. Client machines/devices have a small installed application which mediates its connection to a server running a single image of an operating system or application that multiple clients are connecting to. The client device only serves to view an image of the “screen” that the server gives and transmits keyboard and pointer/mouse input back to the server. This is probably the solution with the lowest cost among the bunch but offers good flexibility and control over data and applications. But it has limitations. For one, because of the fact of sharing, some applications may not support it. Also, it is very dependent on connectivity and network connection quality. Because it is totally online and virtual, minimum local resources are used and graphics and visuals may suffer as it is dependent on display protocols in handling graphics. Dedicated Remote Hosted Desktops – Similar to the one above but instead of multiple users connecting to a single instance, a separate instance of the desktop is served to only a single user. This offers more power and flexibility compared to the above solution because this allows for all kinds of applications, especially those that do not work in share mode. Dedicated remote hosted desktops can be run on streaming mode or remote hosted mode. This allows for some processing to be done locally especially on the graphics component but requires more powerful client devices. Citrix XenDesktop is a common service offering for shared and dedicated remote hosted desktops. Remote Virtual Applications – One of the most common applications on the web, so common that many users do not even realize that they are using cloud computing. Flash games are an example. Imagine your flash games being run in the server side instead of in the client device, which is used only to send control signals like keyboard, touch, or mouse movement and clicks. 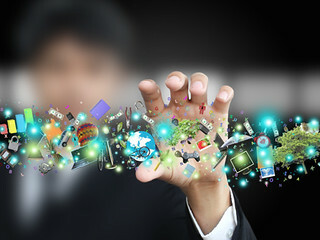 Remote virtual applications are a good example of software as a service (SaaS). What solution to go for? Companies and businesses must choose depending on the type of work an employee does. Some may only use minimal processing and simple applications so will only need the first solution while others may need more dedicated service. Still, some others will need customized solutions, variations from the types listed. It is, therefore, important to select a service provider that offers expertise and flexibility, such as GreenQube. To find out how to move your desktop to the cloud, click here.